Readers of this blog know that for the last few years my travels have pursued the truth about climate change. I refuse to listen to uninformed politicians. I go where people know things. Politicians say that climate always trends. Visiting our National Parks has taught me that climate trends have never changed this fast. Some species have no time to adapt. They are going extinct. Rapid warming drives tropical bugs and diseases north, and people have no time to adapt to malaria, dengue fever, chikungunya, and zika. Visiting Alaska showed me rapid glacial melting, which raises sea levels; and permafrost, a storage sink, which when it melts releases disease-causing microbes, methane (34 times more destructive than greenhouse gases), and poisonous mercury into the atmosphere. 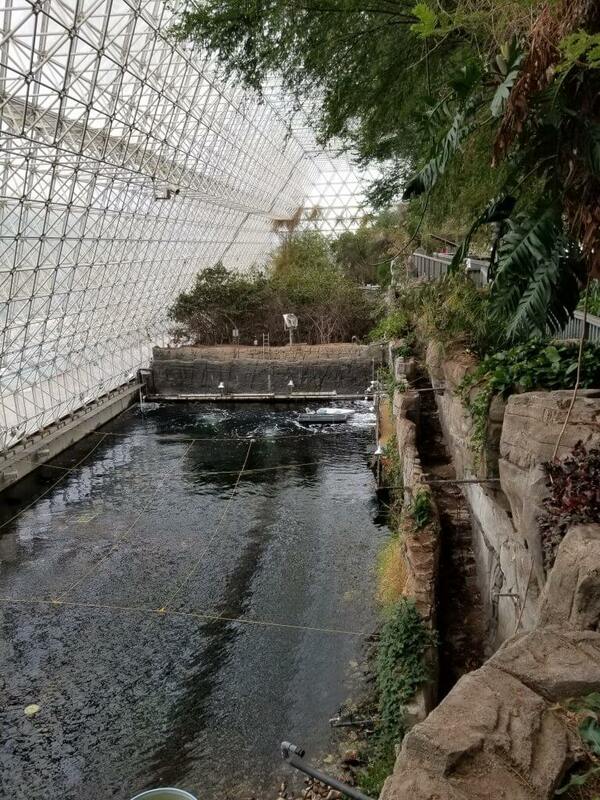 Space exploration motivated the concept of Biosphere 2. 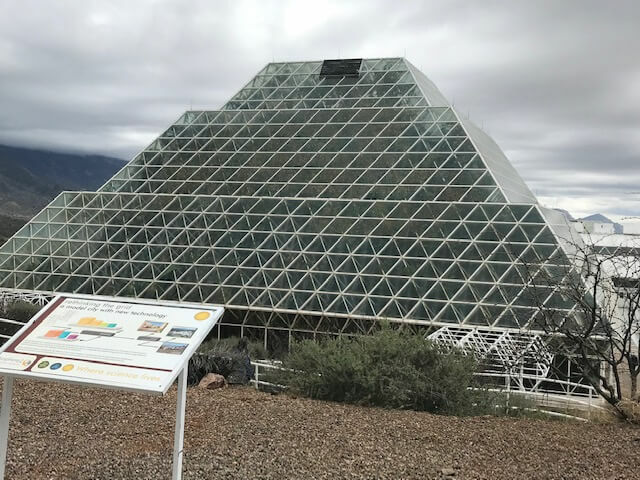 In 1991, 8 scientists entered a huge sealed glass structure north of Tucson enclosing 7 ecosystems to observe what it takes to sustain life in a controlled environment which could be theoretically used to colonize Mars. Kind of like in Peter Weir’s Martian. Except that B2 agricultural research already knew that when the main character “waters” his potatoes, the salt in his unprocessed urine would kill them. 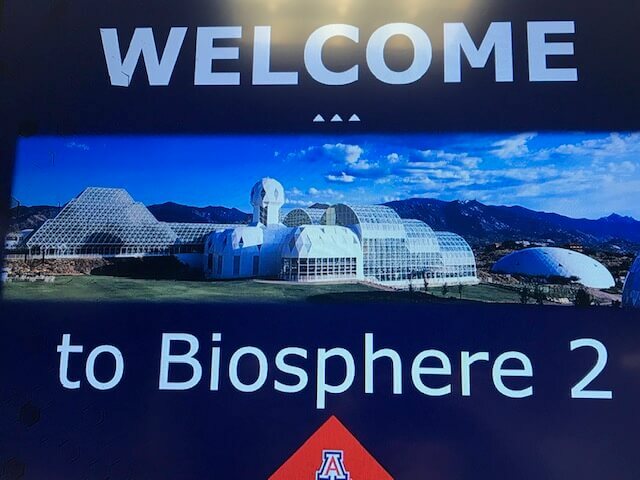 Now directed by the University of Arizona, the B2 complex is unsealed and involved in different groundbreaking discoveries, the most compelling one for me being the research on carbon dioxide. Hey, one glass of wine is natural, but six glasses…harmful? What does a breathalyzer say? An experiment in the B2 Rainforest revealed some shocking information about CO2. Rainforests clean our air by absorbing about 40 percent of manmade carbon dioxide. During the late 1800’s, the CO2 in our atmosphere measured 200 parts per million. Today it has risen to 400 parts per million. 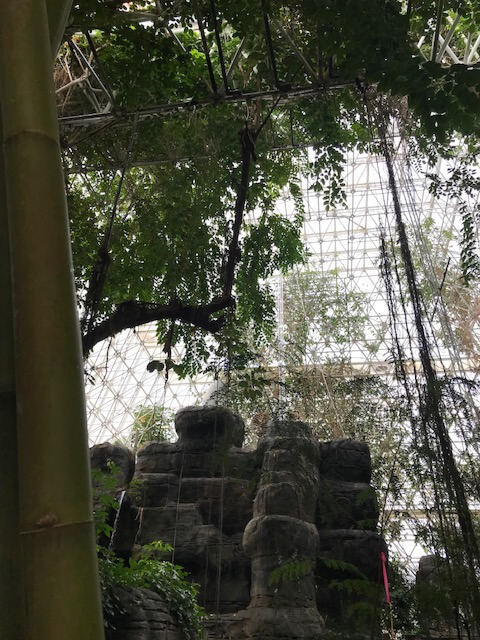 The B2 experiment discovered that once carbon dioxide rises over 600 parts per million, the rainforest can no longer absorb and reprocess it. That’s a problem. 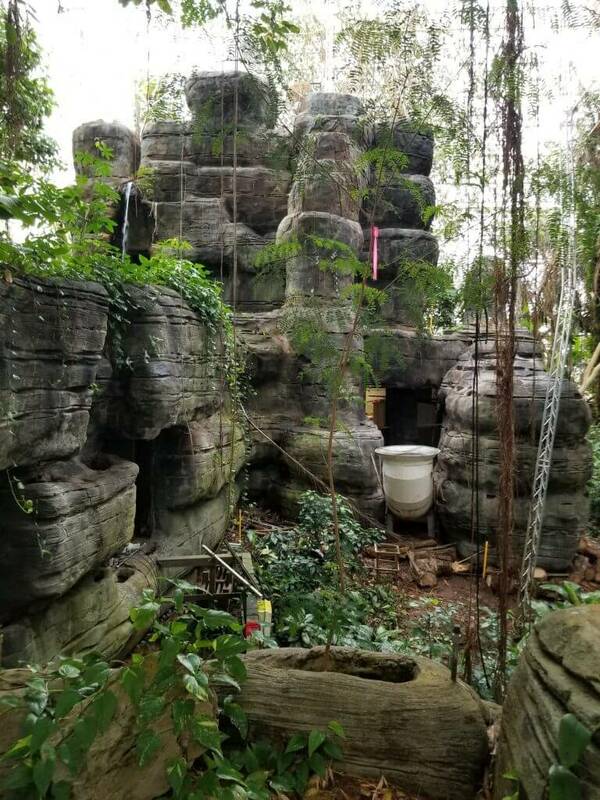 Deforestation also diminishes the amount of cleaning a rainforest can do. We must work harder to protect it. So what happens if too much CO2 remains in the atmosphere? B2 experiments on coral reefs give us answers. Elevated levels of carbon dioxide in the atmosphere increase the amount that dissolves in the oceans, which raises acidity. Acidity prevents coral from building skeletons and shellfish from building shells. Coral reefs are disappearing faster than rainforests, but statistics vary, so I’ll just say: reefs could all go away during your children’s lifetime. This ocean used to have a reef in the middle, but tests for CO2 exposure killed the reef. Reefs are important spawning and feeding grounds for fish. To lose fish as a food source would lead to catastrophic food shortages. Couple that with the drought shortages, and it’s enough to make a Mother Earth cry. The Biosphere 2 Ocean will soon test new types of CO2-resistant coral. If you visit a year from now, scientists may offer new information and hope. 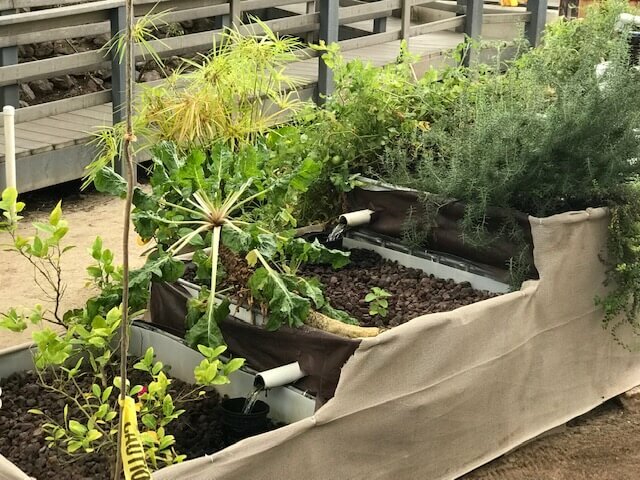 These are just a few of the important research studies you’ll see, not to mention displays about the human atmosphere created by 8 people locked in a 3.14-acre greenhouse for 2 years. Entrance is cheap, $22 for adults; kids and seniors are less. Plus, there’s a coupon on their website. Check Groupon, too. Then visit and learn for yourself. Our houseguest, who took some of those photos, is also in the Climate Reality Corps. He was trained by Al Gore about 10 years ago. That would be fascinating to see. Good to hear there might be hope. Some hope. We’ll know in a year. By that tie, though, how many more reefs will be bleached out by acidity? I always learn something when you post. Keep on writing! I am always learning. There’s so much we don’t know. And some of us know way less than others! Now I better understand how CO2 is directly affecting the coral reefs. Hopefully enough educated individuals/groups are pushing against the uninformed. I finally got it, too! The whole destruction process is complicated—and rapid. Hope B2 comes up with a solution soon.